With all the new inventions in smoking devices, the below infographic takes a step back and reveals a bit of the history behind smoking and all the devices used through this time. Take a look below! Honor societies can be a great choice for those looking to both network and establish some great connections. But many people aren’t sure where to start when it comes to researching and applying for different groups. The below infographic details out a lot of great information as well as where to start. Personally? I’m a beer drinker, but if I’m to be completely honest, I’ve always had an interest in learning about wine. The below infographic is a great place to start learning about the many personalities in wine culture that we definitely got a kick out of. The economy has continued to go global over the past twenty years, especially with major expansion in import/exports from Asia. 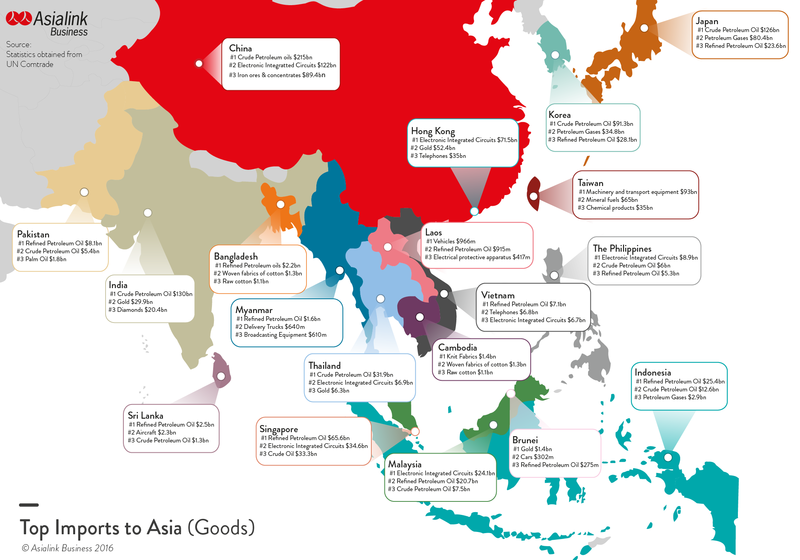 The below map shows Asia’s top imports from some of the most active countries, which we found extremely fascinating. Does the type of uniform you wear during competitive sports have an affect on your performance? The below infographic dives into some studies that show what colors have proven to give athletes just the slightest of edges in sports.